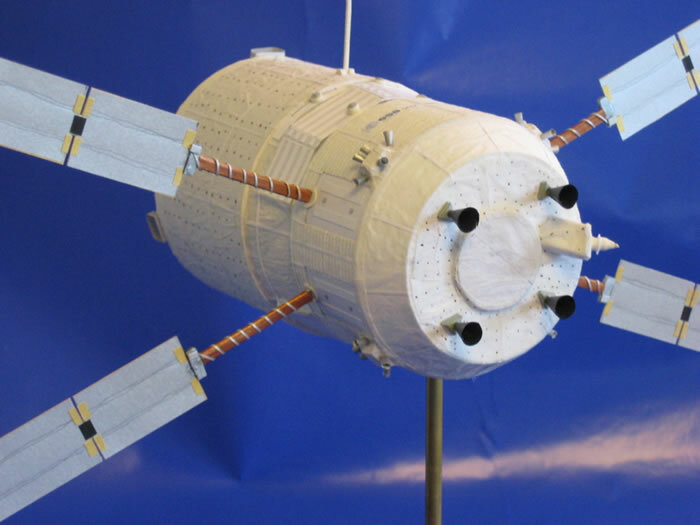 Here is my 1/48 scale European Space Agency's Automated Transfer Vehicle (ATV) Johannes Kepler. The 1/48 scale model is scratchbuilt out of card and various types of paper. 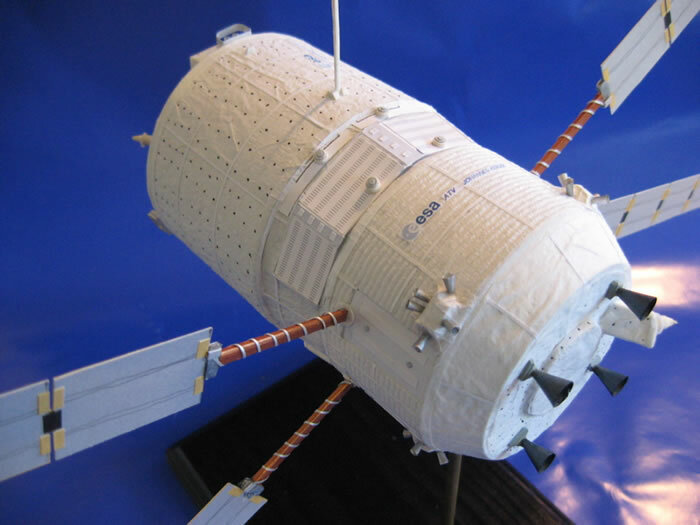 Tissue, napkins and toilet paper -- stiffened with a 50-50 mix of white glue and water -- were used to replicate the various types of thermal insulation blankets that cover the real vehicle. 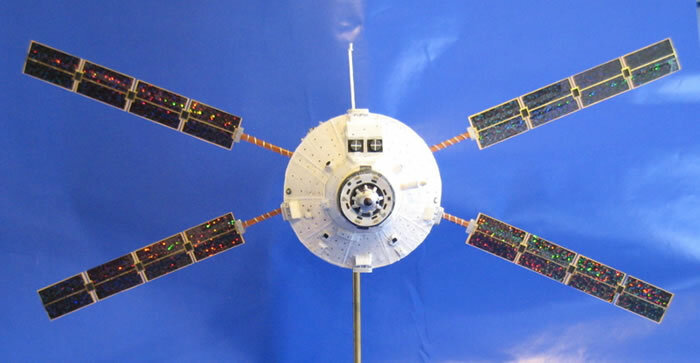 In a compromise to strength and rigidity, though, each solar array has a thin strip of brass running down the center, and the arms are cut from wooden coffee stirring sticks; that said, each solar array still has over 40 pieces of paper on it, including a 3D paper used to replicate the solar cells. Everything else on the model is paper of some sort. 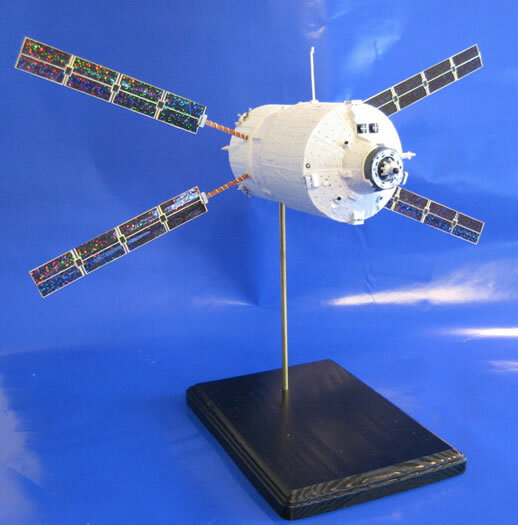 Everything on the model is scratchbuilt, from the Russian Docking System in the front to the Propulsion Module in the rear. I used templates from a card model designed by Ton Noteboom (enlarged to 1/48th scale from the original 1/96th) as the basis for the model, then added all the details and insulation blankets. And, yes, the rows of black dots -- grommets used to hold down the blankets -- are crooked on the real vehicle. Kepler is supposed to launch aboard an Ariane 5 later this year.